न्यू गर्ल. 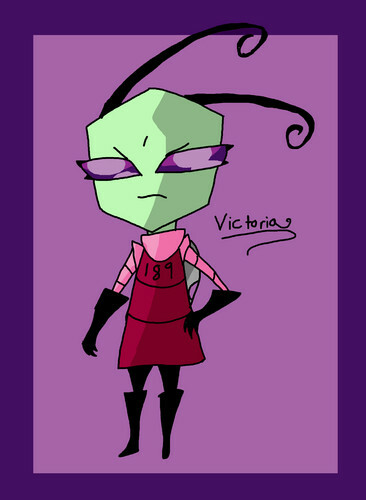 This is my new girl Victoria she is a transmission drone. And she is the most insuffrable meany on the face of Irk! She lives with Tina it's complicated after that :3. HD Wallpaper and background images in the Invader Zim FanCharacters club tagged: invader zim irken oc. hmmmmmmmmmm.... *thought bubble* *thinks of the maricruz and misty argument at the party* *thought bubble pops :3* *derp face* I guess your right .u. derp! then that means .. fights :D !! I love a good fight between characters so much action >:3... oh but wait! no! I need to protect my lil ocs *grabs miniature Leon, Mason, and Misty* don't worry guys ill protect you! Leon, Mason, and Misty: .~. ?